Find and compare the best prices from a range of well known car rental companies at Basel Airport. This is a free to use facility, enabeling you to book direct with the company quoting the price. 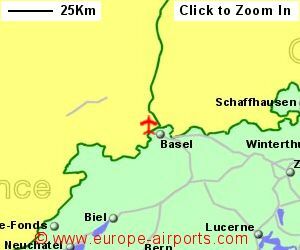 Basel Airport, otherwise known as Basel-Mulhouse-Freiburg Airport, is located Also known as Euro Airport (code EHP) due to it serving Switzerland, France and Germany, but located in France, close to the Swiss border and the city of Basle - . 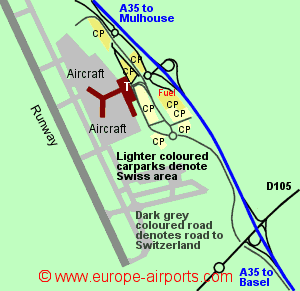 The airport has a terminal divided into a Swiss sector (Basel) and a French sector (Mulhouse) sharing the same runway and plane handling facilities. If you go from one terminal to the other, you are officially crossing the border between the two countries. Although the airport is entirely within France, the Swiss sector has it's own car parks and it's own road system, going directly to Switzerland without crossing any French roads. As a result the airport is also known as Euro Airport. Some airlines have check-in desks in both sectors of the terminal while some only have a presence in one sector. There are good bus services from the airport and the Railway station in Basel gives train access to Switzerland, France and Germany. There is also a train station at Freiburg. A taxi to Basle is likely to cost 20 Euros, Mulhouse 50 Euros, and Frieburg 125 Euros. Basel-Mulhouse airport has 12 bars/restaurants, 9 shops, 1 currency exchange, 3 ATM's, free unlimited WiFi Internet access, and fuel stations in both the French and Swiss sectors. Basel airport now has Duty Free Shoping available to arrivals. 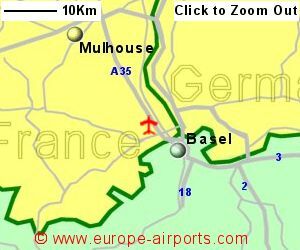 Basel-Mulhouse airport has Airport Carbon Accreditation, at the Reduction level. 7.9 million passengers used the Euro Airport in 2017, an increase of 8% from the previous year, and the the airport's busiest year yet.